If you happen to be in Los Angeles you must make a stop into Phillipe the Original in Chinatown for the best French dipped sandwiches. 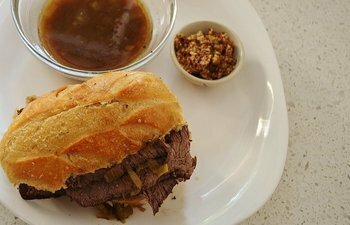 While all their versions are pretty yummy (lamb, roast pork, turkey or ham) it’s their classic roast beef French dip that is iconic LA food and I had to recreate the sandwich at home for when the craving just needs to be satisfied. This is the restaurant’s classic recipe adapted for the slow cooker. Much cheaper than a plane ticket! 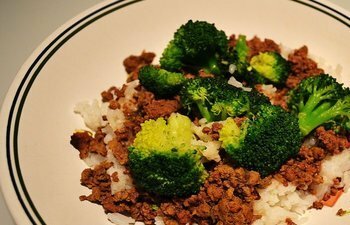 A bit of a twist on a popular Chinese dish, which is typically made with sirloin strips, this slow cooker version uses more economical and fuss-free lean ground beef. This is a staple for my family on Tuesday piano practice night when we come in late and need dinner in a hurry. I prepare my rice in a rice cooker just before we leave and keep it on warm for our return. Being transplanted to Tampa over 20 years ago has opened my eyes to the culinary wonders of Cuban food: black beans and rice, Cuban sandwiches, arroz con pollo (chicken and rice), café con leche, and this dish, Picadillo. Tampa’s Cuban community originated in the late 1800s in what is now Ybor City, named after its founder, Vicente Martinez Ybor, and continues to be a huge cultural and culinary influence on the City of Tampa. 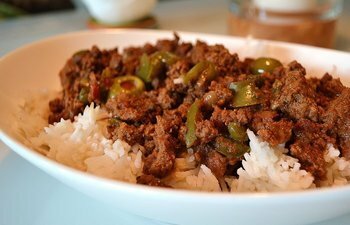 I found this history of picadillo from Tampa’s Junior League, a philanthropic and social organization that, among other things, is famous for its locally-based cookbooks, which have graced Tampa kitchen counters since 1961: The name comes from the Spanish word “picar,” meaning “to chop” or “to mince,” and it seems that many Latin American countries have their own twist on the basic ground beef recipe. In Mexico, it’s sweetened with honey, giving it a teriyaki-like taste. In Puerto Rico, it is used as the filling for empanadas and can include cheese, ham and rum-soaked raisins. In the Dominican Republic, picadillo can include hard-boiled egg and a bouillon cube. The Cuban version is a balance of sweet-salty due to the pimento-stuffed olives, capers, vinegar and raisins. 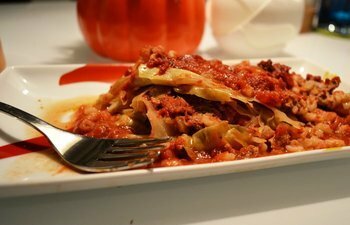 This is a super easy version of stuffed cabbage as there is no stuffing and rolling; only layering! The taste that we love about stuffed cabbage rolls, however, stays the same. I was perusing a magazine and came across a recipe for “mop sauce”. It looked like a barbeque sauce to me, but upon researching exactly what is a mop sauce, I learned that it is a thin sauce applied to meat as it is being grilled or broiled. While containing a lot of flavor, it is thin enough to leave a thin layer on the surface of the meat that soaks in as the meat cooks. Let me tell you, I am now a huge fan of mop sauces! It eliminates the need to marinate a meat, leaves the meat tender, and imparts such amazing yet subtle flavor. Best of all, you can save most of it to serve with your grilled meat, hence, “mopping” up the meat with it. 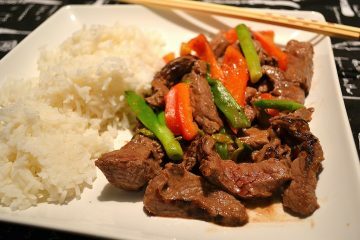 Most mops contain Worcestershire or soy sauce, but I mimicked the smoky flavor without all the preservatives and sodium. It’s sweet and tangy all at the same time! 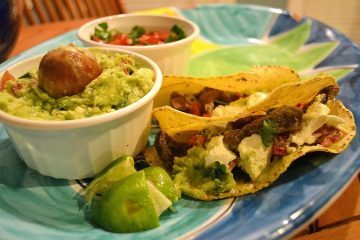 Fajitas were originally made with skirt steak, hence, the name fajita coming from faja or “belt”. Texas ranch hands have been making them since the 1930s and the dish’s popularity is still evident in every Mexican or Tex Mex restaurant in the U.S. 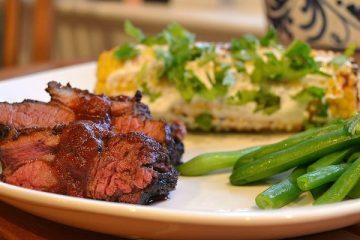 Skirt steak is tough and typically marinated overnight for tenderness prior to grilling, but the slow cooker automatically takes care of transforming the meat to a tender, flavorful base for this meal. 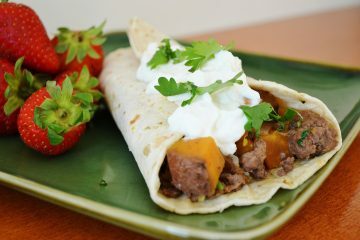 When I make a skillet ground beef meal I usually serve the mixture over rice or quinoa but since this had a Mexican flavor to it I decided to wrap it in a flour tortilla. This burrito was delicious and got 2 thumbs up from the family. The freshness of the orange juice and zest really stand out in this quick Asian stir fry. When you are craving red meat, this really hits the spot! Noodles are one of the two main staples in daily Vietnamese meals (rice being the other) with rice noodles more prevalent than wheat. 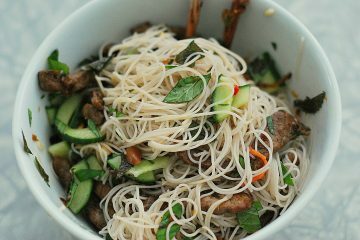 A cool noodle salad, or bun, is one of the most traditional ways of eating rice noodles in Vietnam. It is an amazingly intricate dance of tastes, textures, and temperature. Although you will most likely find bun made with quickly cooked pork at any of the many bun stands in Saigon, my favorite way to order it is with sirloin beef. Here is my version, which earned 5 stars at my dinner table. Make this on a hot summer night with a side of sweet mango slices. I love gyros so much that I suffer through most crowded fairs just so I can eat this classic Greek sandwich. Now I am not equipped at home to make the shaved lamb/beef mixture, but I wanted to make a version of it at home to satisfy my cravings. 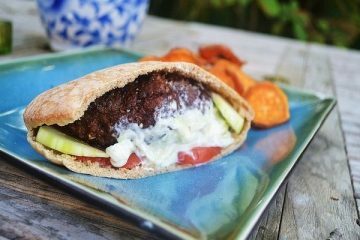 I knew I could make a burger version with pita bread instead of a bun. Craving satisfied! Ttzatziki sauce, a Greek cucumber yogurt sauce, is traditionally served with the gyro, but I have made the sauce optional, substituting plain yogurt instead. If you have the time and/or inclination, I highly recommend you make the tzatziki; it’s so worth it! You’ll find the recipe below in “The Whole Meal Suggests” section. It will not be added to the shopping list, so you will need to add these ingredients manually to your weekly list.